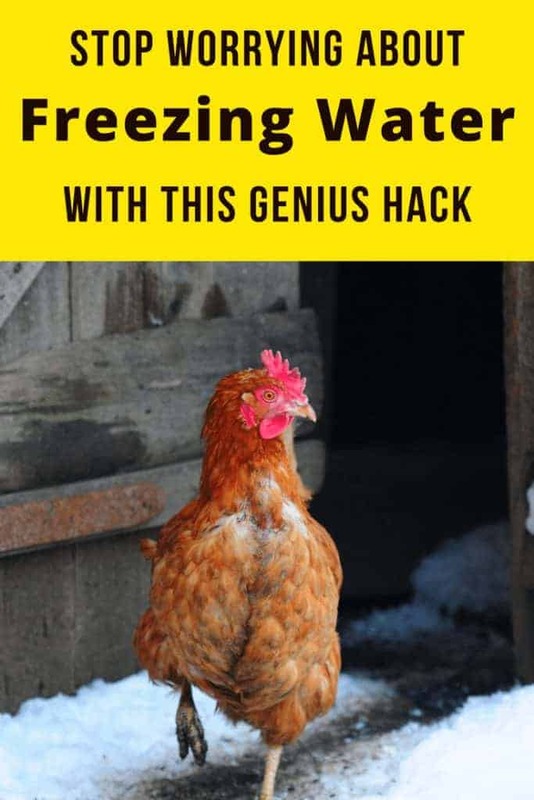 You are here: Home / Our Animals / Chickens / Use This Insanely Foolproof Hack To Keep Your Chicken’s Water From Freezing This Winter! Cold weather will soon be here….and that means frozen chicken waterers. Ok, so why not use fresh water in the bottle? Yes, they do freeze, and it’s not super easy to prevent them from freezing because of the metal. We only use tubs for water in the winter – even the mason jar waterers get frozen and clogged. But the tubs aren’t foolproof either – they still freeze unless you use a tank heater (and then you’re talking about using electricity). 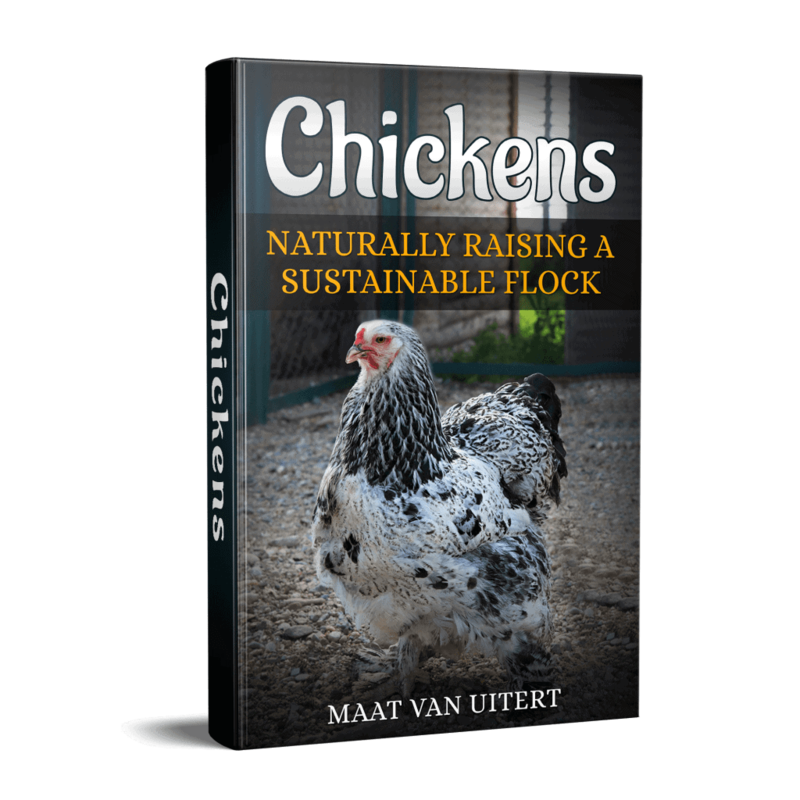 Last winter, we tested a bunch of ways to keep our hen’s water from freezing and found a method from another blogger, Staci at A Chick And Her Garden, that worked better for us than anything else out there. In fact, it’s nearly foolproof, at least for us it was! We use large tubs of water – think 40 gallon tubs – for our livestock. I’ve learned that the larger the body of water, the less likely it is to freeze solid. Because we’re soda drinkers, we always have empty 2 liter bottles hanging around the house….perfect for creating a buoyant object to place inside the water tubs. First we filled the empty soda bottles with water, then added 3 cups of table salt to the bottle. Each bottle then went into a 40 gallon tub – and we kept our fingers crossed it would keep the water from freezing. While in very low temperatures the water will still freeze (when it’s 20 below, it’s going to happen no matter WHAT you do), we found that even when it got in the teens in our area, the fresh water didn’t freeze! Now bear in mind, that you don’t want to add salt TO your chicken’s water – that will potentially dehydrate them and mess up their electrolyte balance. You just want to add salt to the water in the bottle. You want to make sure you use a plastic bottle – glass or metal will conduct cold faster. Plastic is better to use in cool temperatures. For this experiment, we found that table salt is better than kosher or other large-crystal salt since it’s easier to create a high-salinity solution with table salt. Well, you might think it’s because salt water has a lower freezing point than fresh water, and the higher the concentration of dissolved salt, the lower its overall freezing point. However, we’re placing the salt water inside a bottle – which is then placed in the water tub and not in direct contact with the fresh water. So, the lower freezing point of salt water has little effect on the water around it. So the other, more applicable, reason this method works is that the salt water bottle moves in the fresh water because of wind/air currents, mini waves caused by chickens dunking their beaks into the bucket, and natural movements in the earth around it – and moving water is less likely to freeze. Great question. Adding fresh water would do little to keep the water liquid in lower temperatures – the water inside the bottle would just freeze as fast as the water around it. The lower freezing point of the salt water means it’ll stay liquid and moveable on the water surface longer. Kind of. If your tub is large and filled with gallons and gallons of water, a small bottle of salt water would have less of an effect. 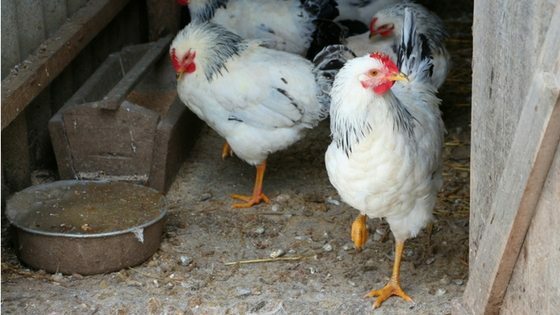 In a smaller tub, a large bottle of water might make it hard for chickens and livestock to get to the water – so in this case, size does matter. This sounds great. Can,t wait to try it. Excellent idea. Trying it in a rubber feed tub with plastic Arizona tea bottle this winter and making a platform to keep it up off cold ground, both purposes, no bending to refill and clean out., chickens will walk up a ramp to drink. Her where I live it’s-40 for much of the winter. I guess I’m SOL.